A data privacy campaigner has signed up 25,000 people to a "class action lawsuit" being taken against Facebook. Max Schrems alleges that the way the social network monitors its members' activity on and off the site puts it in breach of EU laws. As part of the claim, he also alleges that the company co-operated with Prism, a US surveillance scheme. Facebook has previously denied knowing about Prism before it was mentioned in leaked US government documents. The company has, however, acknowledged complying with national security requests from US government agencies. Facebook has not commented on the wider case being brought against it. The BBC understands it does not plan to respond until it has been served the relevant papers. Mr Schrems asked Facebook users based outside the US and Canada who wished to take part in the case to sign up via an app. The case is targeted against the company's Irish subsidiary, which is responsible for all accounts belonging to users outside of North America. It has been filed with the Commercial Court for Vienna, the 26 year old's home city. 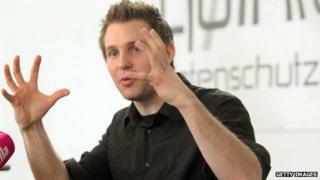 Mr Schrems is demanding 500 euros ($667, £396) in damages for each of the first 25,000 people who signed up to the case. While the Austrian legal system does not make provision for US-style class actions, Mr Schrems is working round this by getting the other participants to transfer their financial claims to him, which is permitted. If he wins he intends to share the money after delivering a 20% cut to a German firm that is funding the case. While the promised payout might have helped him attract support, Mr Schrems says the money is a side-issue. Instead, he explains, the dispute with Facebook is intended to be a "model case" that sets a precedent addressing the wider problem of tech firm developing products that comply with US laws, but are not adapted for other countries' rules. This is not the first action Mr Schrems has taken against the social network. In 2011 he forced the firm to reveal all the information it was holding on him. When he discovered the 1,222 pages of information included details he thought he had deleted or had not consented to being shared, he lodged a complaint with the Irish data protection commissioner. The case has since been referred to the European Court of Justice, but has already resulted in the firm restricting its use of facial recognition software and making it easier for members to find out more about the data held on them. One of the UK's leading data protection lawyers, who is not involved in the case, suggested the latest action could deliver a landmark ruling. "The current climate of data protection enforcement in the EU in the courts and by the data protection regulators, coupled with an increasing awareness by consumers of their rights means that this case could well run its course in the Court in Vienna and achieve a result for Max Schrems and Facebook users," said Robert Bond, a partner at the law firm Speechly Bircham. Mr Schrems has limited the number of people involved in the case to 25,000 because each participant's submissions must be vetted. However, he says other Facebook users wishing to take part can still register their interest in case he later decides to expand the legal action.